Preparing yourself and your landscape for the coming months is super important, so it is vital that you follow most of these tips and tricks. With the weather finally warming up outside, it is tempting to want to get right into the garden. Gardening in spring, however, can prove to be a tricky business. Springtime is less about planning and more about preparation when it comes to your garden. Preparing yourself and your landscape for the coming months is super important, so it is vital that you follow most of these tips and tricks. Keep reading to find out how to best get your landscape ready for spring! One important aspect of gardening are the tools that you use, and early spring is the perfect time to prepare your tools for use. Start saving containers for seeding and start ordering your seeds and any new tools you may need. Be sure to scrub down your tools with a steel wool pad and add oil to any metal bits. You can even keep them in a bucket of sand to prevent rust from forming. If you are starting from scratch, some basic tools are essential for successful gardening all year around. You need large and small clippers for trimming large branches and pruning smaller plants. Invest in a good, sturdy pair of garden gloves to protect your hands from chemical or thorns. Get a shovel for digging holes, both big and small. Be sure to purchase a large rake and hand rake to clear your garden, loosen soil, and clean up plant beds. If you want to garden more comfortably, consider buying some knee pads. A garden broom is very helpful for cleaning out a garden, and buy some compostable garden bags so you can toss your clippings directly into your compost pile. Before you start planting, it is crucial to clear your lawn and garden of any debris or dead plants left over from the previous season. Add these things to your compost pile. Next, while your topsoil is still a bit damp, get to weeding before weeds spread to other parts of your yard. Do not add weeds to your compost, however, because this can cause them to spread even more. Once the soil has dried a bit, get your mulch down. Everything thrives more and blossoms better when in mulch. It conserves water, and also cools plant roots, feeds the soil, and smothers weeds, so they are unlikely to keep growing. 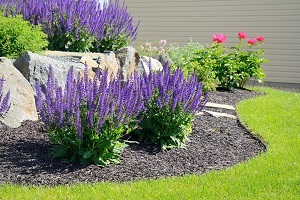 Once you have mulched, finish your plant beds with a sharp edge to make things look polished and put together. This entry was posted on Friday, April 5th, 2019 at 10:55 am. Both comments and pings are currently closed.